Posted in Bright Ideas / Research on December 12, 2014. Welcome to findings of the BrightLocal Local Consumer Review Survey 2014. To see the latest findings, see the Local Consumer Review Survey 2017. This survey is an annual exploration into how consumers read & use online reviews. It seeks to quantify the value that users place on the reviews they read & how this impacts their opinions & actions when seeking a local business to use. The survey is specifically concerned with the reviews & purchase of local business services and not wider product reviews. This is the 4th year the Local Consumer Review survey has been conducted. This year’s survey has evolved from 2013 with 2 new questions added & 3 removed which we felt were no longer relevant or useful for SMBs & SEOs to understand. As with the 2013 survey, the focus of this year’s survey is on consumers in the North American market. We contacted our Local Consumer Panel which consists of just under 5,000 individual consumers, and received 2,104 entries with 90% of respondents coming from the US and 10% from Canada. The survey was conducted over 6 weeks in May-June 2014. 1. 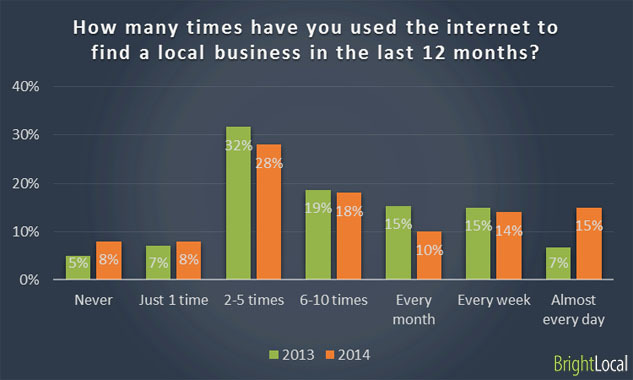 How many times have you used the internet to find a local business in the last 12 months? 5. How many online reviews do you need to read before you feel that you can trust that business? 6. What average star rating is too LOW for you to consider using a local business? 7. How do online customer reviews affect your opinion of a local business? 9. When you read positive reviews of a business, what is the next step you generally take? 13. 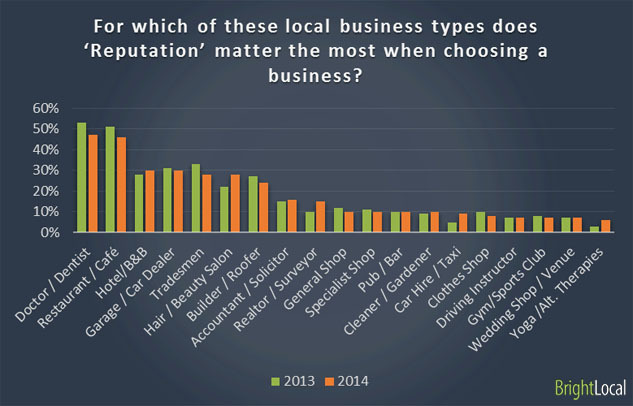 Which of these factors would make you more likely to recommend a local business to people you know? The majority of consumers (57%) have searched online for a local business more than 6 times in the last year – that’s at least every other month. This is slightly up on 2013 – 56%. Most significantly there is a 8% jump in the number of respondents who go online to find a business multiple times each week (7% to 15%) which points to more habitual use of the internet to find a local business. Consumers are becoming more comfortable using the internet to find businesses on both PC & mobile. There are more & better services for locating businesses which make it faster, easier & better for consumers. It’s habit forming and they start to use it with increasing regularity. Part of this growth can be attributed to more local businesses building & improving their online presence. Local data is more abundant & increasingly accurate which delivers better experience for consumers – i.e. they have a great selection of businesses to consider with lots of information to make in informed decision. Looking at the year on year trend, more people are searching online for a wider range of business types than they were 12 months ago. 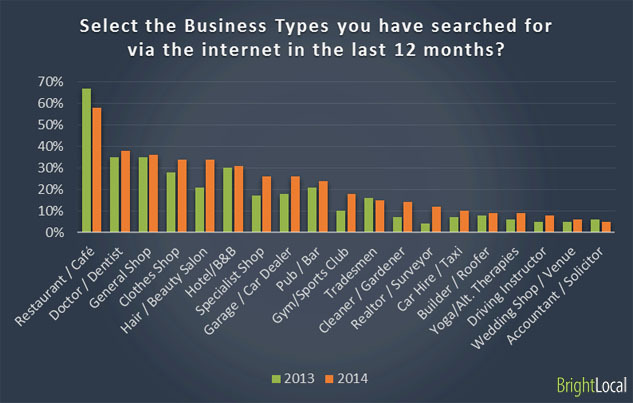 Across almost all business types the number of people searching for that type of business went up. As consumers get increasingly comfortable searching for certain types of business they transfer this behaviour into other areas. Interestingly the number of people searching for Restaurant / Cafes is significantly down on 2013. However we don’t believe that this should set alarm bells ringing for those in this industry. This is still the no 1 searched for business type and this dip may be more reflective of this year’s respondents vs 2013. Overall the results show that lifestyle businesses attract the most searches. As these business are frequented by a huge number of people & more frequently than other businesses this isn’t surprising (more visits = more times to search) and follows the 2013 findings. Almost 9 out of 10 consumers have looked at reviews in the last 12 months to help them make a decision on a local business. What’s more, 4 out of 10 consumers do so as a regular action. As consumers we are growing more accustomed to consulting reviews when we purchase all types of product & service – hotels, flights, cars, restaurants, doctors, plumbers…so why not driving instructors, realtors & gyms? 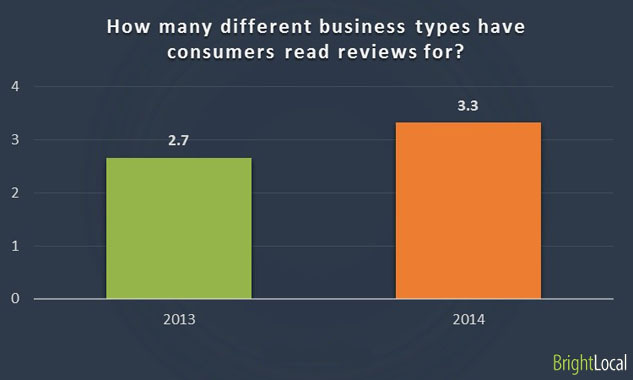 How many different business types do consumers read reviews for? Year on year there is a significant increase in the quantity of reviews being read per consumer for different business types. The local businesses we read most reviews for are restaurants / cafes, hotels / B&Bs, medical practices, hair / beauty salons & clothes shops, and overall consumers are reading reviews for 3 different business types. Hair & Beauty – Interestingly the amount of reviews consumed for Hair / Beauty salons has grown the most significantly in the last 3 years. In 2012 it was 9%, in 2013 it was 17%, and in 2014 it is now 31%. A review may once been the action either remarkable or unremarkable service, but it’s now starting to become an integral part of the purchasing process. This years results show that consumers are reading more reviews than last year with 67% reading no more than 6 reviews (vs 77% in 2013). Significantly, a greater proportion of consumers are reading more than 20 reviews before they feel they can trust a local business. For SMBs/SEOs the significance of these stats is that it sets a benchmark for the number of positive reviews that they need. With 85% of consumers reading 10 or less reviews then we need to ensure that we have at least 10 reviews to satisfy them, but more importantly that the most recent 10 reviews are all positive. If your most recent reviews are negative in sentiment & rating then most consumers won’t look beyond these to the better ones that may lie further down the page. It’s important to ‘manage’ out bad reviews and focus on generating regular, fresh, positive reviews. *This question is new in 2014 survey. 72% of consumers will use a local business if it has a 3 star rating. 27% of users will use a local business if it has a 2 star rating. 13% of users will use a local business if it has a 1 star rating. It’s obvious that businesses with a lower star rating will miss out on attracting new customers, but with this data we can quantify that impact. The biggest differential is between 2 Stars & 3 Stars, with 72% of consumers willing to consider a business with a 3 star rating vs. 27% who would look at a business with a 2 star rating. The jump from 3 star to 4 star is also sizable, with 20% more consumers willing to look at a 4 star business vs 3 star. So for local business owners, you can clearly see the value in having a strong online reputation and how moving the needle from 2 stars to 3 or 4 stars has the potential to win you a lot of new customers. We can see that positive reviews have a great effect on the perceived trustworthiness of a local business. Generally, consumers are quite far along the purchase path by the time they start reading reviews. By the time they get to the point of reading reviews, consumers have already established their ‘need’ and which businesses can meet it; now they’re looking for positive signals to help them determine which business is the best. So it’s clear that local businesses cannot afford to let their online reputation slip as any negativity will directly impact customer acquisition & revenue. 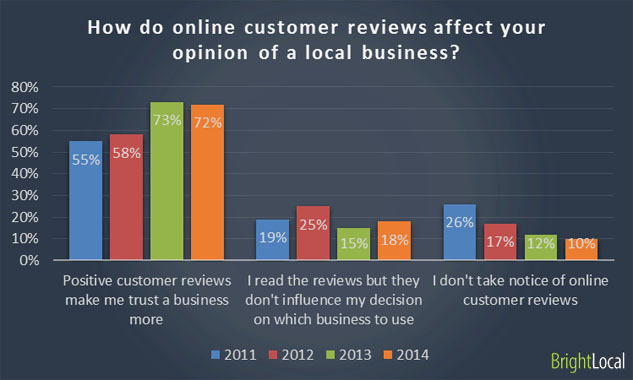 Local consumers are placing more trust in online reviews than ever before. 88% (vs 79% in 2013) trust them as much as personal recommendations. 32% will trust a customer review just as much as a personal recommendation as long as there are multiple ones to read (7% increase from 2013). A further 30% say that they will trust a customer review just as much as a personal recommendation if they believe it to be authentic – underlining the fact that authenticity is equally as important as quantity. 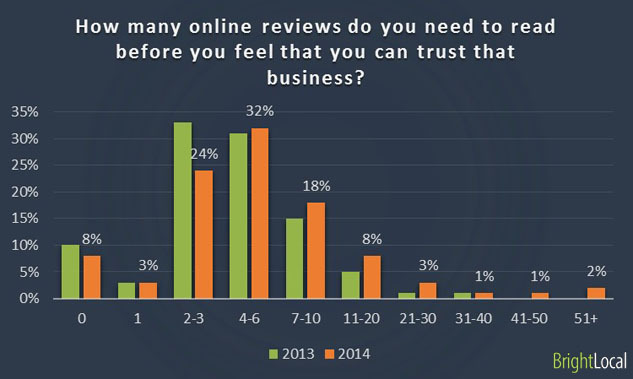 In 2013, 21% said they didn’t trust online reviews as much as a recommendation, however in 2014 this declined to just 13%. Indeed the chart shows a favorable decline in ‘No’s’ since 2011, accounting for a 20% swing. With 7 out of 10 consumers taking positive action to contact business after they read reviews we see the significance in having a positive online reputation. Review reading is one of the final stages in the purchase path and has a direct impact on converting would-be-customers into real customers. 57% of consumers will visit a company’s website, which highlights the importance of having a website that can satisfy the needs of those consumers. 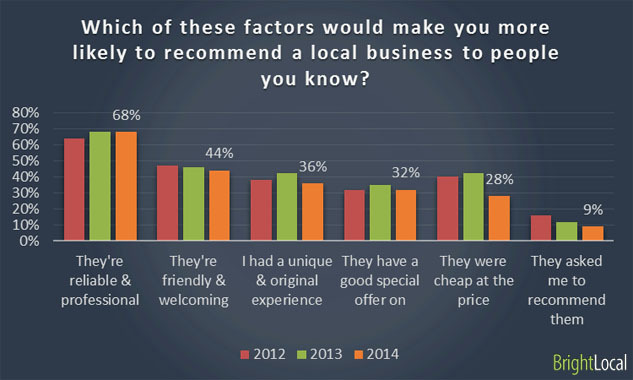 Earlier this year we did a separate study on what consumers want on local business websites. It was clear that displaying critical information such as products & prices, phone numbers & address details, as well as important company information, is essential in allowing potential customers to quickly evaluate if a local business meets their requirements. Interestingly 22% of consumers continue to browse around. Either they consult reviews at a different stage in the purchase path or possibly certain business types have a different purchase profile which involves more in-depth, &/or facetted research. Local businesses which offer a service that is most likely to affect our health, well-being / safety, or comfort, are those which we feel reputation is most important for. It is businesses that offer a leisure service for which this matters least. Local businesses in the medical field or hospitality sector should take additional steps to ensure that not only do they have a good reputation, but that this is also clearly represented online via reviews, which we’ve already seen inspire trust in consumers. A lot of online reviews will often highlight the perceived friendliness or courtesy of a local businesses. However, whilst these are positive factors, we can see that reliability, expertise & professionalism are far more important traits for potential customers. Additionally, whilst accreditation badges are regularly used on local business websites, they are not necessarily as important in the eyes of the consumer. Far more beneficial would be to display reviews or testimonials that highlight the reliability, expertise & professionalism of that business. Value is also an important factor, but above that consumers want to know that they can rely on said business to ‘get the job done’. *We adapted this question from 2013, adding in additional options for respondents to select. Word of mouth is clearly the most popular way for consumers to recommend a business to someone they know. Elsewhere we can look at the contrast between the big two social networks – with Facebook favored over Twitter. Whilst mainstream review sites like Yelp and TripAdvisor are popular for customer reviews, consumers prefer to give recommendations to people they know on a more personal basis. Using word of mouth – or Facebook – is less formal, more social & a preferred way to keep in contact with friends. 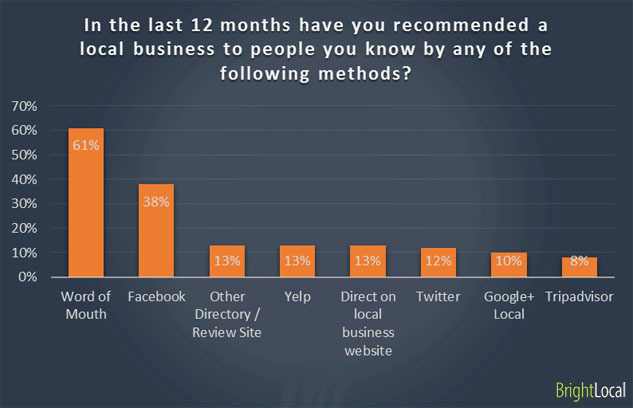 Interestingly Google+ Local was only used by 10% of respondents. It has an overwhelming influence on the lives of search marketeers but it’s adoption by real-world users remains low. Consider the traffic volumes flowing through Google’s interconnected products vs. Tripadvisor, yet Tripadvisor was used by the same number of consumers to leave a review. This highlights how essential it is for social review sites to have an active, loyal audience. For consumers, reliability & professionalism are the most important factors when recommending a local business. Obviously people want to sure that if they put the weight behind a business that it won’t come back to bite them! Similarly the ‘friendliness’ of a business is also important. While many consumers won’t select a business based on softer factors like ‘friendliness’, it is important for those who leave a review. They don’t want to send their friends (or strangers) to a business that will treat them rudely. Interestingly 9% of people will recommend a business if asked to by the business. This act is ‘frowned’ upon by certain review sites (e.g. Yelp) but simply by asking for a review 1 in 10 people will be more inclined to give you one. So if you have 100 customers a day/week then this may help you generate those all important 10 reviews.